Board a narrow train, built between 1913 and 1926 for transporting sugar cane, for a scenic 3-mile circle of the beautiful Caribbean island of St. Kitts. Unfortunately this was a rainy day but we all made the best of the day. The Railway trip was fantastic. Narrow guage railway and they take it (really) slow. Narrow guage railway and they take it (really) slow. All inclusive drinks is an attendent taking your order and then serving the drinks 20 minutes later. Plenty of time to get a couple of drinks. 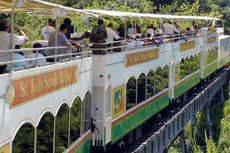 2nd time for us love the rail tour and our guide was excellent narrator on the return bus trip. Different way to tour the island on an old sugarcane rail line. We enjoyed a ride on the train that now runs most of the way around the island. Fantastic tour!!! Highly Recommend. Everything about this was perfect! thought it was a bit pricey but since the walking was minimal thought it would be a good fit for us. We actually booked the catamaran sail and railroad. We actually booked the catamaran sail and railroad. Our other fave of the trip. Very nice excursion. Good way to see the island. Good way to see the island. Not exciting, but decent commentary. Trip ended with beach barbecue at Carambola Beach which was a great addition. A tour of the island by bus to start with and then the railway. A tour of the island by bus to start with and then the railway. Excellent! The on board bar was great - plenty of rum punch and pina colada! And an on board choir! Good commentary. Wonderful views and great fun! Although expensive this was very good, just wish the tour guide on the train hadn’t talked non stop for the hour and half journey. This seems so contrived to take the railway. This seems so contrived to take the railway. It is completely worth it. St. Kitts is underdeveloped, so the railway is a great way to see the coast. Plus there&apos;s also rum punch! A cool way to see the island. A cool way to see the island. Very beautiful and enjoyable. For what it was it was expensive, made up for by drinking lots of rum punches on board.